Papayas are the fruit of the Carica papaya tree. The fruits are typically long, tapered-oval shaped with soft pink-orange or yellow flesh and an inner cavity filled with black seeds. 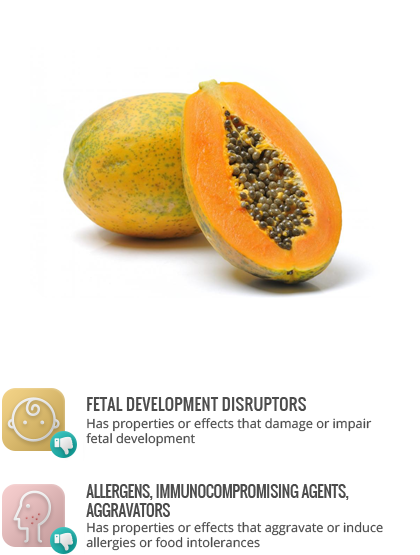 Papaya is a source of folate and vitamin C, and contains some magnesium, and vitamin A. Papaya contains lycopene and polyphenols. There has been suggestion that consumption of large quantities of green, unripe papaya may induce miscarriage. Papayas are rich in papain. See: Lycopene, Papain. Many papayas are genetically modified to be resistant to a virus which can decimate crops. Individuals allergic to latex may be sensitive to papain.